Hi there everyone. We know it’s been a while since we posted a chapter. Please enjoy chapter 9! If you haven’t been able to read the previous chapters, you can head here or to our Directory page where you will find all previous posts. “Of course he asked, since Yunnan’s Prince Mu Qing came of age last month and will succeed the title, the Princess did agree, however, she added a few conditions. First, the one taking part in the competition must be the one asking for her marriage, and though she didn’t care about the written test, which was to be decided by the Emperor, in the martial arts test, she was to compete against the winner herself, not marrying unless she lost,” Yan Yujin drew out slowly. “Both the Da Yu and Northern Yan have been rather politically unstable lately; both have groups that are vying in a cutthroat competition to become the Crown Prince. At this time, whichever Prince marries Princess Nihuang, it would be pretty much the same as taking the position of the Crown Prince.” added Mei Changsu in light tone. “Earlier, you could guess what ever it is Yujin asked; I thought you could actually predict the future.” Xie Bi laughed aloud. Yan Yujin curiously took the silk scroll,and when the three huddled around it and looked, two of them shouted out in surprise. The three of them had all seen the astounding abilities of Fei Liu, and were not surprised that it was Fei Liu who took it, what they were amazed at was the Jiang Zuo Alliance’s absolute power over their domain. They were indeed worthy of their reputation as the world’s largest alliance. Yet after some careful thought, the largest alliance was still in want of a sense of responsibility, since they had allowed their Chief to be ‘kicked out’ like this. Leaving him to wander around bored, to flip through other countries’ letters of credence…Weren’t they afraid he will stir up some trouble? “By the way, are there any conditions or limitations on who is allowed to participate in the competition?” Xiao Jingrui brought the conversation back on topic. “No need to worry about that, I have already signed him up earlier.”Yan Yujin happily replied. The three of them thought carefully, and slowly seemed to remember; it was only because there were so many people entering the capital that they had not noticed. Everybody turned around to see Fei Liu, still dressed, lying on the bed, without even closing the drapery. His eyes were closed and he was already sleeping soundly. Fei Liu’s open eyes didn’t seem to find anything to focus on, and thus instantly shut them again. Mei Changsu rose and watched them leave from the door, then returned to his room. The ten o’clock drums sounded just then; Mei Changsu paused in his steps and wordlessly listened for a moment while gazing at the silent Marquis’ Prefecture in the dark night. After a long time, he slowly shut the door. The city of Jinling had always been known for its excitement, and naturally the center of it was where the Da Liang emperor’s palace was situated. From the south gate, there was a winding, red brick path, that connected to an exquisite mansion that was independent, yet also a part of the palace. The Princess Royal Liyang, the current emperor’s only living sister, the Marquis of Ning, Xie Yu’s wife. Anyone in the capital who was a little bit older, still clearly remembered all the commotion from the year that the previous Emperor married off his beloved daughter. The newlywed couple who looked down over the commoners from the lofty Yingfeng Tower, were the perfect definition of a beauty and a hero. Twenty six years flew by, and the two were still in-love as ever, respectful towards each other, and had three sons and one daughter. All were highly educated and polite–to the people, they were the shining model of a perfect family. The Liyang Prefecture was built when the Princess came of age at 15, but ever since her marriage, the prefecture had been vacant. The Princess thought it would be a pity to leave the prefecture idle, and thus had a garden full of exotic flowers and plants planted, which was fragrant all year round. The consorts and nobility often asked to tour the sight, and it was one of the top sceneries to view in the capital. When the Princess fasted, worshipped, or when the Grand Empress Dowager came to visit, the Princess moved back to her prefecture for a few days. 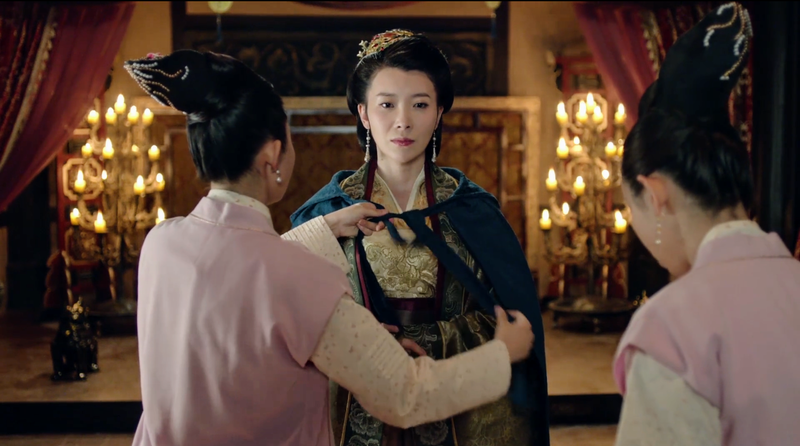 When Xiao Jingrui and Xie Bi returned, their mother just so happened to be staying at the Princess Prefecture. It was an early morning, and the brothers, as per their father’s orders, headed towards the Liyang Prefecture to wait. As they arrived, the Princess Royal’s sedan chair had already been prepared, and was at the side door. Obviously the arrival of the brothers did not need to be announced. They made their way directly into the main hall, where they saw their mother, who had finished dressing and was being led out by her maids. The brothers quickly bowed and greeted her. “Rise.” Princess Liyang smiled, and extended her hand to help them up. She had always been rather reserved, and even the servants who had served her for many years had never seen her lose her composure for even a second. Xiao Jingrui had not returned for many days, and even though she missed him and had worried about him often, she did not show it on her face. She only gazed upon him for an extra second, and did not anxiously ask about his well-being. “Father ordered me to accompany mother back to the prefecture.” Xie Bi had grown up around Princess Liyang longer, and compared to his brother, seemed more close, but still far from the affection of the families of commoners, where children could jump into hugs and be spoiled. Though he stepped forward to hold the arm of his mother in support, it could only be described as respectful. “Jingrui, are you doing well lately?” Princess Liyang asked. After this short exchange of words, the three did not say anymore, went out and climbed into the carriage. After entering the prefecture of the marquis, the carriage came to a stop outside the door, and the two brothers, one on the right, and one on the left, accompanied their mother out. Since the Marquis’ parents were both deceased, there was no need for them to greet them, and so Princess Liyang instructed that they return directly to her own quarters. Following the corridor they passed the side courtyard, where alongside the wall only osmanthus trees were planted. As the blooming season was not yet over, a lingering fragrance hung in the air. Princess Liyang slowed down her pace slightly, as if she were enjoying the fragrance of the wind, and a touch of a smile surfaced upon her lips. At the same time, the sound of a guqin1; drifted across from the other side of the walls. Although it could not be clearly heard due to the distance, it’s ethereal resonance evoked a desire to cleanse one of worldly stains. “Would mother like to meet this person?” Xie Bi hurriedly asked. “But you cannot clearly hear the music from here; why don’t I invite Brother Su to the inner courtyard, to play for mother, but separated by a curtain?” Xie Bi suggested. Xiao Jingrui, upon first hearing his second-brother’s suggestion, had had the same thought as Princess Liyang, and was rather unhappy, but seeing that his mother had refused the offer, did not say anything more. Xie Bi’s intention was not to be rude, but it was due to habits that he had had since he was young, he had always felt that his mother had an exalted status, and should call upon whomever if she enjoyed their playing, and did not think much more than that. He was reproached as a result of this, and his face flushed bright red. After they reached the inner courtyard, Princess Liyang sat on a long couch near the window, and once the servants had left after serving tea and pastries, motioned for her sons to sit at her side; the atmosphere was not as formal and cold as it was before, and they began to converse more casually. In the morning, Xiao Jingrui had been to the Snow Cottage already, but at the time, Mei Changsu seemed not to have risen yet, and with Fei Liu guarding outside refusing to let anyone in, he had not seen Mei Changsu. Although he was now chatting with his mother, the thought that he had not gone to greet his guest yet felt inappropriate, especially since he’d only just arrived a day ago. Xie Bi had much business to take care of both in and out of the household, and Xiao Jingrui wanted to go see Mei Changsu, thus the two did not say anything more, bowed, and left the inner courtyard. “Father will be going to the Commander Hong’s manor to celebrate his birthday, and I need to arrange the birthday greetings and gifts. I must trouble you to tell Brother Su that I will not be able to go greet him today.” Xie Bi hastily explained to Xiao Jingrui outside the second door, and the two departed on their separate ways.